« Don’t forget his running mate. 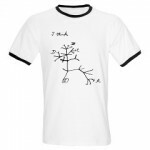 As you know, I have been involved in a little side project designing Darwin year stuff, with half the proceeds going to conservation charities and half to be invested in developing online evolution resources (coming soon, by the way). We’ve had some great success, and it’s been lots of fun.